We're members of CREST, a leading international body providing guidance and best practice in the field of information security. CREST has developed a maturity model to enable assessment of the status of an organization’s cybersecurity incident response capability. The model has been supplemented by a spreadsheet-based maturity assessment tool which helps to measure the maturity of a cybersecurity incident response capability on a scale of 1 (least effective) to 5 (most effective). The tool is powerful yet easy to use and consists of two different spreadsheets, enabling assessments to be made at either a summary or detailed level. The assessment tool has been developed in conjunction with representatives from a broad range of organizations, including industry bodies, consumer organizations, the UK government and suppliers of expert technical security services. 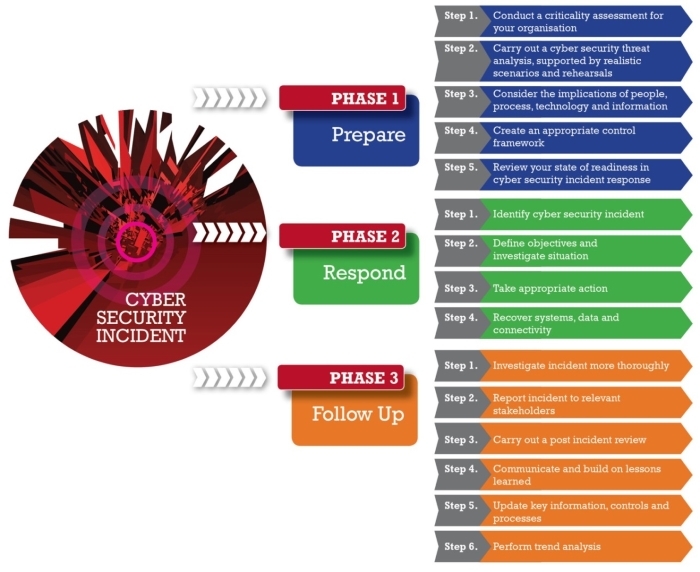 It delivers an assessment against a maturity model that is based on the 15 steps within the 3-phase cybersecurity incident response process outlined below. Threat hunting is the activity of performing proactive “hunts” through networks for indications of malicious activity and software. Modern computer networks are complicated, with diverse technologies and commonly with a geographical spread, combined with the issue of acquisition and subsequent joining of disparate third-party networks. Whilst modern security technologies provide a defence against the more common threats, they are not going to identify 100%, which is why there is a need for human intervention. It goes beyond the traditional signature and rule-based detection and instead uses proactive and iterative data searching techniques to identify threats that evade traditional security solutions. BSI’s threat hunting service has three elements; host triage, threat hunter and memory forensics. Note: threat hunting is a service that is conducted at each stage of the incident response journey both before and after an incident and indeed as an ongoing implementation. Any of the elements can be used to perform a threat hunting exercise and the elements used will depend on the organizations requirements, time available and funding within the organization. Host triage is a consultancy-based service designed as a platform for threat hunting. host triage allows an organization to perform a threat hunting exercise across an entire enterprise quickly without the need of an experienced internal team nor the requirement to have software installed locally on the targeted host. The aim of the host triage service is to perform snap shot in time analysis, over a large estate, quickly. The analysis for a five thousand host organization could be performed within ten days. The threat hunter system is designed to provide a longer assessment of an organization. The threat hunter client software is deployed across the targeted hosts, each host logs data such as process creation and new network connections to a central server. Once the system is operational, our consultants will perform analysis on the logged data to identify any threats or suspicious behaviour. The threat hunter system is typically deployed for a period of a week up to a month, however, it can provide a longer-term monitoring solution if required. The consultant led analysis can be performed on a daily, weekly, or monthly basis, depending on the deployment length and the number of hosts targeted in the engagement. Memory forensics can provide an in-depth view of a host, the operating system state, and the running processes. Whilst the capture of a computer's memory is relatively quick, the analysis normally takes at least two days of analysis per host. Due to the time involved with the analysis, it is important to identify the key assets of an organization, memory forensics can then be periodically performed on a small number of key hosts (2-5). Memory forensics can provide assurance that the hosts do not have any indicators of malicious software running or behaviour that is indicative of a compromise. To provide wider coverage of the network, the hosts involved in the analysis can be rotated. Information (e.g. recording sufficient details about when, where and how the incident occurred; defining their business priorities; and understanding interdependencies between business processes, supporting systems and external suppliers, such as providers of cloud solutions or managed security services). Our incident response service focuses on cyber-incidents ranging from non-targeted malware infections through to Advanced Persistent Targeted (APT) attacks and network breaches. The CIRP service aims to review the customer's’ existing operating procedures and environment to ensure that in the event of an incident there is sufficient information and processes in place to contain the incident in a timely manner, minimizing the impact, damage, cost and reduce any potential reputational damage. The FRP service delivery is split into several phases. The initial phase involves meeting the key stakeholders to identify assets that are likely to be affected or targeted because of an incident, the threats that are relevant to the organization and the scenarios that would have the most severe impact. The third phase will consist of interviews with individuals or groups which will provide a secondary source of information to fill any gaps from the documentation review. An example would be the identification of logging sources for key hosts. The final phase will be the production of a report highlighting gaps and recommendations to improve the organizations internal processes or environment. The final phase will also include the production of up to five run books that provide a detailed strategy for the detection and response methods for dealing with a specific threat. Information management looks to establish a common and practical framework to effectively deal with the rising volume and diversity of information and the associated risks, costs, and complications. We have the expertise to structure IT environments and design information management solutions. So, we can assist you establish best practices for your information management cycles. In addition to developing an incident response policy in an organization, we can also provide real-time first responder services to support you during an attack. Our methodology for incident response provides a systematic and structured approach to respond to a security incident. This ensures first and foremost that the breach is contained, and business operations are returned to normal as soon as possible, while compliance obligations are maintained and impacts of the breach are fully understood. The first people dealing with the incident are sometimes referred to as first responders, ideally as part of a team. These first responders should be able to determine whether any specialist resources – including third parties - will be required. Many organizations do not have the right tools, systems, or knowledge to conduct a suitable investigation. You need to identify quickly when the scope and severity is beyond in-house skills, before decisions are made that may adversely affect an investigation. It is critical for arrangements to have been made in advance so that expert investigators are available at short notice and have enough prior information to be able to hit the ground running. As well as expert cybersecurity incident response experts, other third parties that you may wish to get involved can include technology forensics specialists, technology analysts (for example, database experts), information analysts (for example, accountants), legal experts and on-site police support. Some organizations set up a “war room” during serious cybersecurity attacks. This is the crisis management team’s primary meeting and collaboration space, where all relevant parties (incident investigators, IT staff representatives, stakeholders, and other leaders) assemble to manage the incident from one central point. We can provide first responder services to provide the initial support an organization requires during the early stages of an incident. We also can assist with an on-going incident and recommend steps to contain and eradicate the attacker. Our consultants can engage with a company to prioritize key systems, correlate logs and events and recommend immediate actions to lock out an intruder and regain control during an active attack. We can provide all the technical skills required from hard disk forensics, memory forensics, through to log analysis and network analysis. Collating this information, distilling the key facts, and taking decisive action to protect a company’s assets and systems is a vital skill possessed by our consultants to respond and react to an on-going threat. It is critical in the preliminary stages of an incident or event that all potentially relevant evidence is correctly captured and preserved in a forensically sound manner. We’re equipped to acquire data, including data running in memory, from all manner of systems and devices, from traditional laptop and desktop computers, servers, mobile devices, and cloud-based applications. We’ve an extensive experience conducting forensic analysis activities to uncover the true cause of an incident, its scale, and its impact. Our will analyse network traffic, log files, active memory, disk drives, mobile devices, cloud based systems and any other potentially relevant sources of evidence. We maintains numerous ISO 27001 certified laboratories equipped with the most up to date and sophisticated forensic technology. Our consultants are highly qualified with extensive experience and follow strict procedures including those of the CREST CSIR Scheme. Threat Hunting (see in the prepare section): ongoing threat hunting from end-to-end. We use our eDiscovery experts and technology to fully support organizations in facilitating an efficient review of electronic evidence to meet the scope of a regulatory or court order request. We apply world class project management techniques and leading technology to collect and analyse large volumes of data quickly and accurately. This enables you to make informed decisions for your specific requirements. For example, we can help identify the extent of Personably Identifiable Information (PII) exposed in a breach; facilitate a large-scale document review to help organizations respond to a regulatory request or a court order to produce electronic documents; or analyse and identify the best evidence for use as evidence in legal proceedings. Speak to us for more information on how our Incident Response services can assist your organization in responding to a data breach.